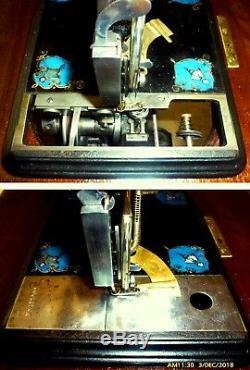 The ONE and ONLY -THE GRAND DAME of EARLY AMERICAN ANTIQUE SEWING MACHINES! Elastic stitch, 10 Mother of Pearl inlays, mahogany wood cabinet with treadle, attachments , Framed Picture of. Patents, Copies of Original advertisement materials. The Grover & Baker (G&B) Sewing machines Company of Boston MA was one of the original members of Sewing Machine Combination formed by G&Bs President Orlando Potter in 1856. Companies: Grover & Baker , Wheeler & Wilson , I. Singer & Elias Howe Companies formed the first in US history Patent pool. In order to prevent themselves from litigations and , of course for the main reason - to control the sewing machine market. They have contributed into the that pool the best innovative ideas they had. This G&B machine was the first machine ever to be able to draw bottom thread directly from the spool instead of bobbin and together with the upper thread to form very unique double knotted two thread chain stitch patented by W.
Grover on May 6 1849. That particular stitch has been superior to any other seams because of it's strength and elasticity. 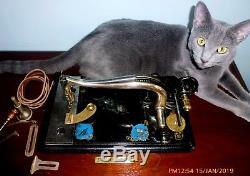 Orld's renown antique sewing machine expert's opinions t. He higher value generally associated with even common G&B machines is due to their unique. 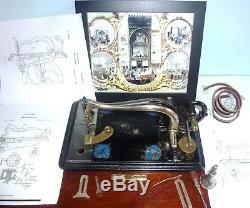 Being offered for sale today is The Famous Silver plated Model # 26, Serial # 127992 manufactured in 1864. The silver plated sliding plates and body of the machine head also carry the numerical marks - # 57940. He earlier versions of these machines has been made starting in 1855 and produced till middle 1860. The mechanism featured on this particular machine has been patented (# 21670) by W. Grover on October 5 1858. And Patent #37,502 of Jan 27, 1863. What is amazing that the same thread formation system is still being utilized on some modern overlock machines. These machines has been hand made with great precision. Even today , 155 years later, all parts in the machines moving mechanisms are perfectly synchronized and functions within themselves as the new ones. This famous company has been making parts, silver plating them and then completely assembled machines for Grover & Baker Co. The Industrial Revolution at it's peak could not justify production of hand made finely crafted and therefore very expensive sewing machines. At that time nobody really cared how beautiful and gracefully curved like a swans those G&B machines were - the production cost and sale price has been the deciding factor. Unfortunately, not too much changes has happened ever since... And now more than ever before due to our society's constant pursue of lower cost most of us have a tendency to overlook or simply brush off such aspects as quality and aesthetics. So, let the truly exquisite appearance of this machine to serve to us as a reminder of that unfortunately begone era. 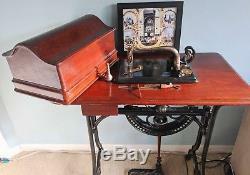 Please look at all these pictures attached: For being 154 years old this machine is absolutely beautiful. The original sterling silver plating is still uniformly distributed on the 2 graceful arches of the machine. The back sliding plate sterling silver plating is appears as new. Of course, there are some chips, paint loss , discoloration - after all it is 155 years old machine... The machine has been completely taken apart , cleaned , adjusted and now turns and function correctly and freely. He gold painted motifs on the cast iron machine table did not survived completely. Some of those original gold paint motifs has retained only as the shadow and some are visible. The 10 beautiful iridescent Mother of Pearl inlays are in perfect condition. 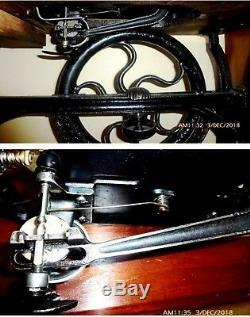 The stationary and moving parts of the treadle and the machine are all in the perfect mechanical condition. Machine is ready to sew and I would do that only if I would be able to see well enough to thread the needle. The mahogany table, cabinet, drawers and bonnet cover - all has been restored to the original specifications. The wood has been carefully hand cleaned, hydrated multiple times with linseed oil and has been sealed to prevent any further moisture penetration and oxidation. The bad quality of my my pictures unfortunately cannot show the beauty of this table - it is exceptionally beautiful selected grade mahogany. If you would like to see additional photos I could provide them. To make it short - The statement in the Harper's Monthly Magazine on August 1861... Does not fail to excite your admiration for the beauty and uniformity. Is surely holds the truth even more now than 152 years ago. During the summer I was very fortunate to have the opportunity to acquire two more G&B # 25 sewing machines. Only then, after some considerations I have decided to part myself with this beauty and offer this complete unit for sale. I can offer the number of options (4) to package this machine. It would depends on the new destination location. Completely take it apart : remove the machine from the table , treadle wheel and iron stand from the cabinet (4 screws) and to pack it together with cover in one carton with a lot of impact absorption media. Please note that ever popular bubble wrap does not provide any effective protection at all from the forces of impact being transferred to the fragile cast iron parts. To take apart very heavy and unique mechanism of treadle is absolutely necessary in order to provide adequate protection not only from mentioned above impacts but also from effect of very rapid movement within the carton with parts. Only HD closed cell foam can absorb and dissipate the forces and guarantee the safety of content. I have created the pictorial assembly instruction with step-by-step description of assembly process. The folded treadle is 29 x14 x14, cover - 18x14x10, head is relatively small and will fit with proper impact absorbing insulation into separate carton. You know very well that any lateral impact could do the damage to the cast iron even if the wood wall would be build on the 4 sides , especially considering that the center or gravity would be high. Honestly - it is not the safest option. Well, the space on the back sit of any regular size 4 doors car would be the perfect for that task. 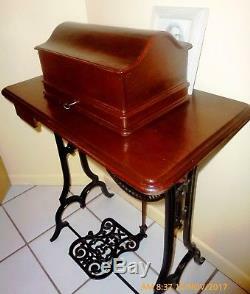 1 1864 Grover & Baker sewing machine head - 1 Mahogany cabinet with 1 drawer and bonnet cover with the key. 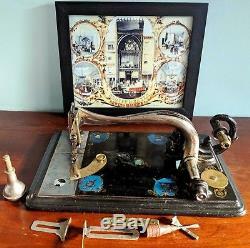 Set of cast iron legs , treadle wheel mechanism , treadle pedal with Pitman rod. 1 Cloth guide, vintage Grover & Baker , Sterling Silver plated -collector's item by itself - just try to find another one!! 1 Thumb screw , Vintage Grover & Baker, Silver plated. Vintage Grover & Baker with markings , Sterling silver plated. 1 Grover & Baker quilting attachment , Silver plated. Catalog, description book, Historical data on Grover & Baker , 40 pages -all downloaded from Smithsonian Institution Web-site and printed. I could send to you the electronic files. 1 Grover & Baker Advertisement Art , Professionally Digitally re-mastered , printed on canvas , in beautiful wood frame with glass. 1 F, S, Chase patented. Silver plated pocket oil can. 1 Small vintage screwdriver , wood copper steel. 7 Copies of Original 7 Grover & Bakers Patents with drawings. 20 pages of Original Grover & Bakers advertisement literature. Total weight of machine, cabinet , treadle - 82 lbs. With proper packaging with HD foam, etc... It would be 3 cartons 120 LBS total. 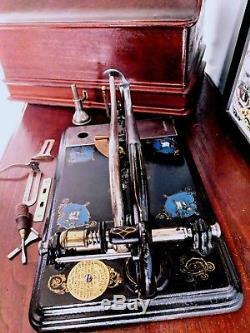 Sewing machines have always been a part of my job. My background in mechanical engineering combined with some nostalgia, passion and plenty of time on my hands has made the great implication on my current activities Antique and vintage sewing machine restoration. 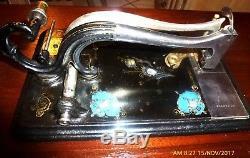 In order to retain the authenticity of original time-honored design, those fine details which once embellished the antique sewing machines and my own clear. The metal parts and treadle legs refinishing no stripping to remove the original finish, no rust preventative primer, no decals or clear coating to make it more appealing in a photo. Here is a brief description of. Clean surface with Murphys oil soap. Chrome plated parts and apply a thin coat of a mixture of Boiled linseed oil & turpentine on the originally painted parts and re-assemble machine. Gear driven machines are being properly cleaned, greased and oiled, the timing is being checked , bobbin case or shuttle are being taken apart, cleaned and oiled for smooth thread draw, stitch adjusted to be equal on both sides. If appropriate for that particular model/class, machine is being tested to sew at slow and fast speeds and in reverse on numerous layers of denim to assure it is sewing with ease. For machines with motor /light /foot pedal control the following steps are being taken to assure that machine is electrically safe to operate: the motor, pedal, light wires, are inspected for electrical safety and replaced (if necessary) from the coils to the connector. The foot pedals are being cleaned and adjusted for smooth speed control. The machines I offer for sale are electrically safe and fully guaranteed to sew very well. Please feel free to ask any questions. The following information you should know. I must be contacted within 24 hours of receipt of item to initiate a return. Only after the issue has been verified I will accept a return. If you do not do this we cannot guarantee receipt of the return and will not issue any credit. I will issue a credit after I have actually received the item and verified the issue. Please contact me with detailed address information for accurate quotes. I will pack all items with a great care with utilization of proper force of impact absorbing materials. As the rule , I will place the sewing machines head into the double-box and will use bubble wrap or rags inside the first box. If it would be a treadle or cabinet sewing machine , I will double-box machines head separately. I will disassemble cabinet / irons legs (if appropriate), then I will write the instruction with photo attachment of step-by-step assembly process to avoid any possible confusion during assembly. Or if it would be required, I could even crate the cabinet and will place and secure machine head in the double carton underneath. I put a lot of effort , time and quality materials into cabinetry restoration process and it would be extremely upsetting to me if the finished piece would be broken during transportation. Tracking information is also available directly on E-Bay page. Please note that the tracking status provided on E-Bay's website is not updated regularly. It is my responsibility and the matter of honor to make sure that my listing is thorough, honest, and accurate. Please feel free to contact me with any inquiries. I will try to respond within 24 hours or less. I encourage and will enjoy all communication with other members. Feedback system is critical to our E-bay community. User Feedback speaks to the reputation and trustworthiness of both E-Bay's buyers and sellers. I take it very seriously and hope you will do the same. The honest communication is the most critical factor. I hope everything would be in accordance with you expectation. I will try my best to provide accurate item descriptions and high quality photos for all my listings. The item "Grover & Baker Early model#26, Mother of Pearl inlay, Silver plated, Mahogany, c1864" is in sale since Tuesday, January 15, 2019. 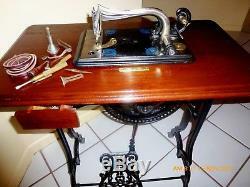 This item is in the category "Antiques\Sewing (Pre-1930)\Sewing Machines". The seller is "dmr1826" and is located in Boca Raton, Florida. This item can be shipped worldwide.